Folding roofs lack the inherent rigidity of fixed hardtops, so convertibles can shimmy a bit more over bumps — a condition known as cowl shake. The A5 convertible can get noodly over extended sections of broken pavement, but it isn't excessive. Our test car had a Sport package with 19-inch wheels and a sport-tuned suspension. It also had adaptive shock absorbers, a feature included with Audi Drive Select. All things considered, ride quality is quite good. Some may find the car too firm over major bumps, but the suspension dispatches smaller imperfections with little drama. I tried to tell a difference in ride comfort between Audi Drive Select's three modes, which purport to adjust suspension damping along with everything else, but I couldn't. If you can, I have a dozen mattresses and a pea for you to sleep on. It's likely that the greater difference in ride comfort lies between the sport and base suspensions, the latter of which uses 18-inch wheels. Like Mercedes and Volvo, Audi has long cultivated its own steering feel, and the A5 augments things with an optional speed-variable steering ratio that's not unlike BMW's Active Steering. Some may decide the progression from gobs of power-steering assist at single-digit speeds to minimal assist at higher speeds feels staged and unnatural. (To be fair, most cars do this to some degree. Audi's is just especially pronounced.) I found the execution superior to the last Audi Q5 crossover we tested, whose oscillations between the two extremes felt sudden and unpredictable. 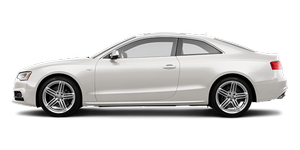 The A5 is easy to wheel around parking lots and alleyways, though its 37.4-foot turning circle is a bit wide for this league. At higher speeds, the wheel firms up predictably to deliver a natural, weighty balance with good turn-in precision. Like the A4, it encourages all sorts of mischief on back roads and highway interchanges. More good news: Unlike the V-6 A4 we tested earlier, the A5 doesn't have an overwhelming degree of nose-heavy understeer. It's easier to slide the tail out, easier to point the hood where you want, and altogether more fun to drive. Audi says its latest generation of Quattro all-wheel drive diverts more power to the rear wheels under normal conditions, so the driving experience on dry roads comes closer to that of a rear-wheel-drive car. The A4 never left a real sense of that. This Audi does. Before you bang the gavel on steering, be sure to check out an A5 with Audi Drive Select. Comfort and Dynamic modes render perceptibly different characteristics: Comfort maximizes steering ease at low speeds, but the wheel returns a loose, unsettled feeling on the highway. Dynamic mode resolves that, and it also reduces body roll to acceptable — but not true sport-coupe — levels.